Working with something new can be quite frustrating. I don't know what your skill level is with Linux, which is the OS that is running your Raspberry PI. So please forgive me if I cover something you already know. If you're putting the music in a folder on the SD card before you actually are using the SD card to run the PI, then that folder is most likely inaccessible from the OS. To get the music to reside there, you would have to copy it from another source such as a USB flash drive while actually running the PI. Just like moving stuff from machine to machine in Windows. Doing the copy of the music from a flash drive from the PI desktop is relatively simple, but running Fruitbox from the desktop is not a good idea and in most cases does not work correctly. So you can use the desktop to do maintenance type stuff, but not for running Fruitbox. If you are doing the copy from within the PI, then the Music directory is most likely /home/pi/Music. Regardless of how you get your music files here, you should confirm that this is where they are and that you can actually see them there. In the fruitbox.cfg file, you would point to your music path. If you have your music in the Music folder, and you can see it there when you are running the PI, then the path is /home/pi/Music. It is important to note that unlike Windows, Linux folder paths are case sensitive. So /home/pi/Music would not be the same as /home/pi/music. Most of your examples that you gave showed that you were trying to use relative paths to your music. While they can be convenient, they can also come back to bite you. I prefer to use the full path to my music files. That way there is no confusion. It is possible to play your music directly from a flash drive without having to copy it around. I do this to allow for changing up my available music selection periodically. That requires the flash drive be mounted as a drive. Flash drives do not auto mount when running the PI in console mode. So you would need to, as part of your Fruitbox startup procedure, have a way of verifying that the flash drive is inserted and then mount it before actually starting Fruitbox. I do this in a bash script. If the flash drive is not inserted, fruitbox won't start and the script complains. I also use switches (or flags) in the fruitbox startup to tell fruitbox where my music and database files are. That way they can all live happily on the flash drive and I don't have to mess with editing the skin file when I want to make some sort of change. This is just an overview of my method and would require further explanation if you're interested in trying it. I'd also be happy to share the startup script. It will look like nothing happened, and you'll end back at a command prompt. But the entire user guide will now be in the userguide.txt file. You can view it or print it at your leisure. You are making progress. That's great news! Before I can answer your question though, I need to know if you are running Fruitbox from inside the PI desktop or are starting up the PI in console mode. Edit: On the assumption that you're running PI in console mode, I'll type something up shortly. I'm cooking supper right now. Food before computing in my house. OK, supper is over and I'm sipping my Diet Coke so I have time to type. Again, if I cover something you already know, I'm sorry. Just trying to be thorough. A little Linux 101 to begin: Linux does not use drive letters. Everything hangs off the root directory ('/' without anything after it). A single hard drive can be a single volume, or can be broken up into several volumes depending on how it's configured. A volume hangs off the root directory at a mount point. A mount point is a folder when viewed in a directory listing. If the associated volume isn't mounted, the folder is empty. If a volume is mounted, then there will be files and folders listed in the mount point folder. I needed to power up my PI for this bit of explanation and what I see may be different that what you see so bear with me. When I insert my usb stick and have started PI in graphic desktop mode, the flash drive mounts under the /media/pi folder with the volume name of the flash drive. In my case, my flash drive is named MUSIC (all caps) so the full mount point becomes /media/pi/MUSIC. When I start PI in console mode, even if the flash drive is present, it doesn't automatically mount. So Fruitbox can't find it. Most flash drives are seen by Linux as a hard drive. So when you have the flash drive connected to PI, regardless of whether you are running in console or graphic mode, Linux creates a device node for it in the /dev folder. In this case, drive device nodes begin with the prefix sd, have one letter following, and a number to indicate the partition. In my case, my flash drive only has one partition on it. So in the /dev folder when I have the flash drive plugged in, I have an sda entry which is the flash drive itself and an sda1 entry which is the first (and in this case the only) partition (or volume) on the flash drive. That makes the path to the partition containing my music /dev/sda1. That path will be important later. This will return at least two entries. /dev/sdX and /dev/sdX1 where X is the letter we are looking for. If you get "total 0" the mount point is there and ready to use. Skip this next bit. Explanation: Factory formatted flash drives have a fat32 format (It's a Windows/DOS thing). Linux expects to see something else. So we have to tell Linux to expect fat32 instead. -t vfat does this. One other thing in order to be able to write the database to the flash drive, we need permission to do so. By default we don't have. -o umask=000 gives us permission (actually it gives us more than we need, but it works). And see all my MP3 files. If you get this far, then you're ready to start Fruitbox. Explanation: My Fruitbox is installed in a folder under my home folder: /home/pi/Fruitbox. The skin I'm using is a custom one I designed for my project that looks like the flip pages of a Seeburg wall box from the 1950's. My mount point for my music is /media/pi/Music. Regardless of which of my flash drives I plug in, this is always the mount point I use. Using these command-line switches, you can tell Fruitbox to look at your mount point for the music and database and ignore the entries for those things in your fruitbox.cfg. If it doesn't find a database, it will make one. If you change the music you have on the flash drive, you need to erase the fruitbox.db file from the flash drive. This will force Fruitbox to re-read the list of music files and re-create the database. Please try what I have outlined above. If it works for you and you want my startup script, let me know and I'll post it here for you. If I've created more questions that I've answered, I'm sorry. Ask away and I'll do my best. Edit:Posting the script anyway. Let me know what happens. # Script for starting Fruitbox. # database. Output is run off to logfile.txt for later review. echo -e "No Music drive found.\nPlease connect a USB drive with the music to play.\nExiting"
I have a question to ask, when I press the button to get a credit, it does not make me add more credits. Is there a possibility to insert other credits and add them to the current credit? What settings should I put in order to have a credit for two songs? All up and running now! I had a good read through your notes that you sent and decided to re-install rasbian from scratch as i was only running the lite version. With the full version in desktop mode i was able to see all the devices i had plugged in and the full file path names. Thanks for your help on this one it is much appreciated!! Another new one if you know anything about these... I have a touchscreen that works on the GUI but not inside the TouchOne skin. It is a touchgenie overlay. Is there a quick way to get this up and running or is this not possible? These are designed to mimic jukebox machines with up to four coin slots (for example, coin slot 1 could be for 5c, slot 2 50c, slot 3 $1, etc. ), and so you can assign different values to each. If *all* of these values are set to zero (or not defined in the config file), then fruitbox enters "FreePlay" mode, and pressing any of the credit buttons has no effect. If one of more of the above parameters is set to a non-zero value, then fruitbox starts up in "credit" mode, and you have to insert coins (by pressing ButtonCoin1, ButtonCoin2, ButtonCoin3 and/or ButtonCoin4) before you can select a song. The credits will increase every time you press a credit button. When fruitbox is running, you can switch between freeplay and credit modes by pressing the ButtonFree button. If you started in free-play mode, then by definition all your four PlaysPerCoin parameters wil be zero. Obviously this is not compatible in credit mode, so fruitbox will force all these values to 1 when you switch. I'm very glad you're up and running. Unfortunately I don't have any experience with the touch screen aspect. I want to, just not there yet. Mike, the software author may be your best resource for that. I have seen a lot of discussion on the forum about diagnosing them but haven't been paying attention. fruitbox defaults to assuming the touch screen is the official raspberry Pi one, so if it's not you have to tell it otherwise. ..this will allow you to configure the buttons for Touch (for TouchOne skin you only need Left/Right, Random, Skip, Vol+ and Vol- ... for the other buttons just press <ESC> on the keyboard rather than touching the screen). Then fruitbox will create a file called fruitbox.btn which it will then use the next time you run it normally. Just a word of warning however; in the current release there are a few known issues with working with some touch devices, so if you are unlucky your touch screen won't work.. However, in the next fruitbox release (1.12) I think those issues have been resolved. The next release will be available in the next week or two, but there's loads of great new changes in it so it's under test as we speak. Thanks for that Mike I'll give it a go later tonight when home and see what happens! Thanks for this software I've been after something like this for quite a while! Awesome. Can we Play Music-Video Clips with the Update? Yes! ... but only in ogv (Theora + Vorbis) format. Ah O.k. But i prefer "Xmedia Recode" for Converting any Formats to any Formats. Its still the Best Converter i found. First, thank you for this beautiful sw.
Second. I tried running with the WallJuke skin but it does not work. The program needs more memory (as I read in the forum) but I have selected 512 with the memory division. This may be because I have the desktop open? Is it necessary to run it only in console mode? The original shows an erroneous message due to an error with the var "xxxSONG_NOT_xxxx" when the correct one was "xxxNOT_SONG_xxx"
I hope you do not mind. I would recommend you run directly from the console (256M of GPU memory has always worked for WallJuke). Maybe there are some other apps running which have grabbed GPU memory too? Thanks for correcting the skin... well spotted. I have now made the same changes to the file in GitHub. 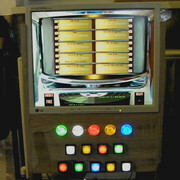 Finshed my little Jukebox Today. I wanted to delete the rpi-fruitbox-master folder from RASPBIAN STRETCH WITH DESKTOP to insert the new folder with the changes made. How do you do it does not make me erase it. The format conversion is no problem. Currently I have a few music clips with video that I would LOVE to play. Combining this with normal music in jukebox is really appreciated. 1.-Is there any way to put it in a batch file? I searched the forum but I can not find it. I'm sure it's easy, but my Linux level is too low. 2.-Could it be compatible to hear music through the USB input? The answer to question 1 is yes. If you look back a few posts you'll see a discussion I had with another person about much the same thing. In fact I posted a copy of the script (batch file) I use to run my copy of Fruitbox. The answer to question 2 is, it depends. If you're planning on playing music stored on a USB device, the yes. If you are using a USB hard drive you'll need to have a way to power that drive. The Raspberry PI power supply may not be able to do that for you. Flash drives work just fine. That's what I use. If you want to stream the music over USB, then no. The same discussion I had about the script also has a discussion of how to use a USB device as a source of music files. If there's anything else, just ask. I have a problem with the music volume output at 3.5mm. With miniature amplifier 2x12W sine wave to test. The keys "=" + "-" have no function in all skins !? Entering the [Sounds] SongVolume (0..100) in the fruitbox.cfg had no effect. Is there an offset setting on the SoundVolume, or is Raspi's default? My English too bad, so translation from Google. Since my post was still not registered after 70 minutes, I found the solution in 3 other forums.